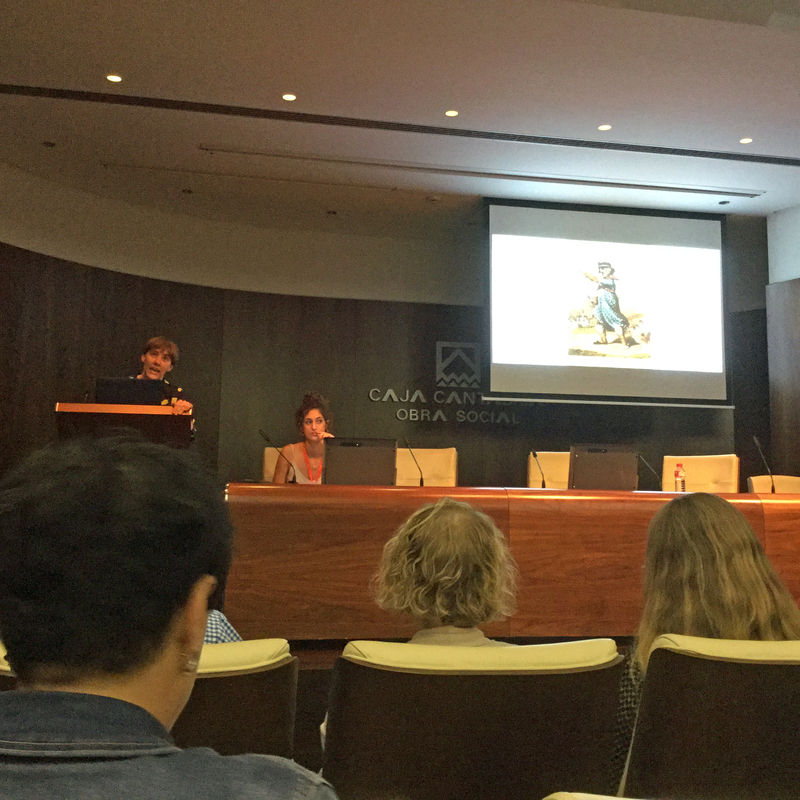 Some of the DCA Print Studio team and associates recently travelled to Santander, Spain to present at the IMPACT 10 printmaking conference. We caught up with them about the trip on what they presented, what they loved and why IMPACT is an important event, in the next instalment of our A-Z of DCA Print Studio: K is for Knowledge! IMPACT is a biennial multidisciplinary printmaking conference now in its 10th edition - it brings together artists, printmakers and academics, providing the perfect platform for sharing (K is for) Knowledge! Please give us a brief introduction to your presentation(s)? "I joined Jacqueline Butler in co-presenting a paper called The Chaos Printers which discusses her residency at DCA Print Studio and the resulting artworks, for which she used 3D scanning and 3D printing combined with film, photography and traditional print processes. A key component was the dialogue we shared during the project. I also presented my own talk about DCA Print Studio's decade long collaboration with Ilana Halperin, who uses geological phenomena in the landscape: from underground calcifying waterfalls to silica-encrusting Icelandic lagoons. 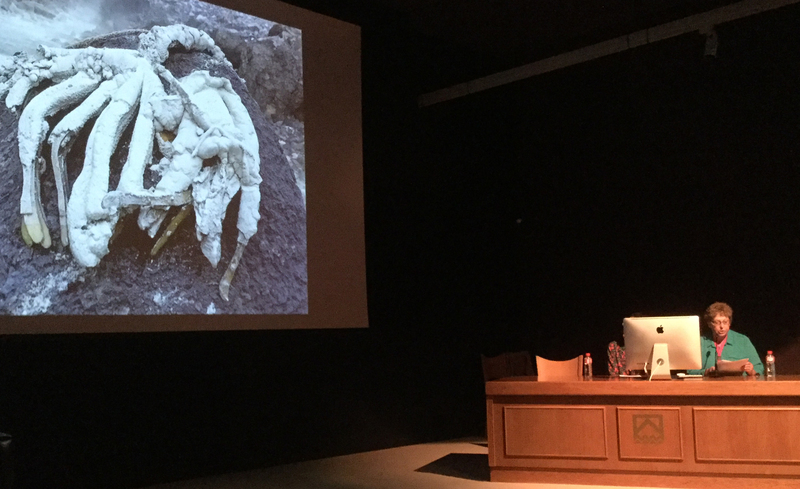 This talk was titled A Hand in Time, as the varied processes Ilana uses all exploit geological time, and expand the boundaries of print as a medium, blending it with sculpture. Why is IMPACT significant for the world of printmaking? "IMPACT stands for 'International Multi-disciplinary Printmaking, Artists, Concepts and Techniques "
"I have been lucky enough to attend most of the IMPACT series of biennial conferences since they started in 1999. IMPACT stands for 'International Multi-disciplinary Printmaking, Artists, Concepts and Techniques ' and the initiator Steve Hoskins, of the University of West England, has always aimed to keep them as open as possible to allow an intersection of academic study and practice-based work, along with opportunities for exemplary exhibitions. The exhibitions have included major artists in the field, but students and others are also encouraged to show their work in portfolio sessions. For me they have been an opportunity to keep up with developments in safer and greener processes, new technologies and the latest academic research. There are usually around 400 delegates from over 35 countries at each conference so it is brilliant for networking and keeping up key relationships. In 2013 we co-hosted IMPACT in Dundee, with Duncan of Jordanstone, which was the most amazing week of print-based events and exhibitions, including in DCA Galleries." What was the most interesting presentation, panel, exhibition or open portfolio you saw during the conference? "Among many others I found two of the speakers who were on the same panel as me really fascinating. One, Iwona Abrams, has been experimenting with melting glacier ice to make the most beautiful prints. The other, Tracy Hill, described how she has been using a very sophisticated cutting edge 3D scanner to map a wetland landscape, and manipulate the resulting scans to make traditional hand-printed photo-etchings. The resulting prints very successfully achieve her aim, becoming a 'visualisation of the point where our physical and digital worlds overlap'." Sandra De Rycker, Editions and Publications Manager. "My talk was about the ‘social encounter’ and language in the co-operative making and idea exchange that happens during the development of an original print in DCA Print Studio - and how this practice often remains hidden behind the Print Studio doors - an un-exhibited component of the work. Specifically, I explored the processes and dialogues that took place during the making of artist Andrew Lacon’s edition with us, and how during this process, a kind of shared language developed: between people, materials and processes, in order to arrive at a material outcome in the form of a print." What makes IMPACT significant for the world of printmaking? "This was the first IMPACT conference I had ever managed to attend, after hearing about it and reading papers written for IMPACT over the years. 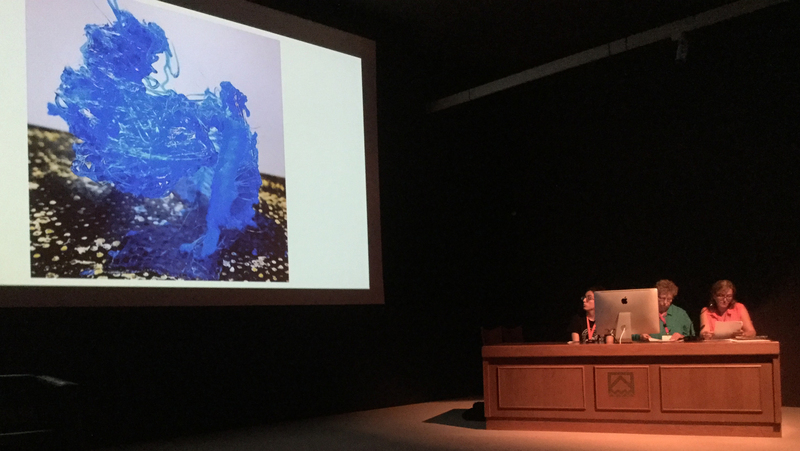 It’s an incredible forum for everyone involved in printmaking from artists, to museum professionals to academics: people from as far as New Zealand, Australia and China were there to share the latest critical research, observations and innovations in this area in relation to contemporary art practice." 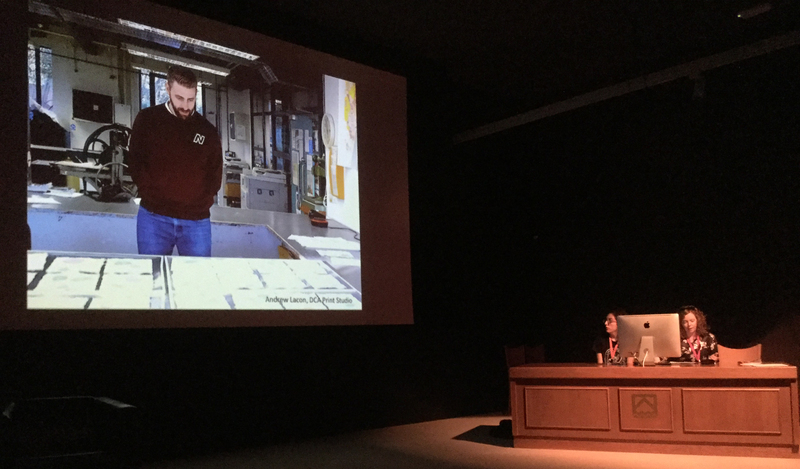 "I really enjoyed the talk given by Sioban Piercy (Head of Fine Art Printmaking at Centre for Creative Arts and Media, Galway, Ireland) titled: The Insincere Object: A Critical Evaluation of the Skilfully Made Work Within Contemporary Fine Art Printmaking Practice. She traced a recent history from Duchamp’s ‘ready-mades’ onwards, looking at the emphasis of concept over craftsmanship in art and how as a consequence ‘lack of evident skill somehow implies the presence of concept’ (Glenn Adamson). Ultimately she called for a re-examination of the inherent values in skilled making as a site for creativity, invention, and originality – emphasising the depth and meaning that may be made through the process of making – something I see happening regularly in our own Print Studio at DCA!" Please can you give us a brief introduction to your presentation? "I gave a paper called 'Techno-utopia and Technophobia’ which traced moments of contradictory attitudes toward technology in print culture. This included Lord Byron’s use of new steam press technology to promote his anti-industrial, highly romantic poetry, benefiting from the very machines he was against. I also talked about how I have used new and traditional printmaking technologies together in my work to explore these contradictions." "As a PhD student, IMPACT was a great opportunity to meet other artists, academics and print professionals who are interested in printmaking. It also was the first time I delivered a paper at an academic conference! IMPACT acts as a way to get to grips with how printmaking is viewed globally, what the important trends are and how artists are working in this time of tumultuous change in production technology. The number of papers and exhibitions on show really allowed for a broad discussion of printmaking practices and introduced me to likeminded individuals." "One of the most interesting presentations for me was by Stephen Hoskins entitled: 'Encountering Printmaking an industrial continuum, technology looking back to go forward’. He discussed the relationship between industrial processes and printmaking, pointing out that, contrary to popular belief, artists are not very good at using new technologies in their work. I was fascinated by the way he looked to past printmaking processes from the poster industry to shed light on how artists can and will be using new technologies such as 3D printers in the future." Please give us a brief introduction to your presentation? "I co-presented with Annis Fitzhugh, the paper reflected on conversations that occurred between Annis and I over the duration of my residency at DCA. Contemplating on enhancing and expanding the development of art theory through the act of making arts practice. The idea of the ‘unused’ and the ‘random’ acts, of confirming and non-confirming; the joy of breaking rules as key to the creative making, and how chaotic behaviour in both mental and physical acts brings new philosophies to arts practice. The work I produced whilst at DCA titled Neither Here Nor There acted as catalyst for the conversation piece. The work interweaves photography, printmaking and new 3D technology." "interweaves photography, printmaking and new 3D technology." "My background is in fine art photography and filmmaking so I was delighted to be invited to present at IMPACT. As an outsider to the discipline, it was my first experience of a printmaking conference. The conference reflected the current ambitions of printmaking, to move beyond the preconceived ideas many fine artists have of printmaking as a secondary medium to other fine art disciplines. 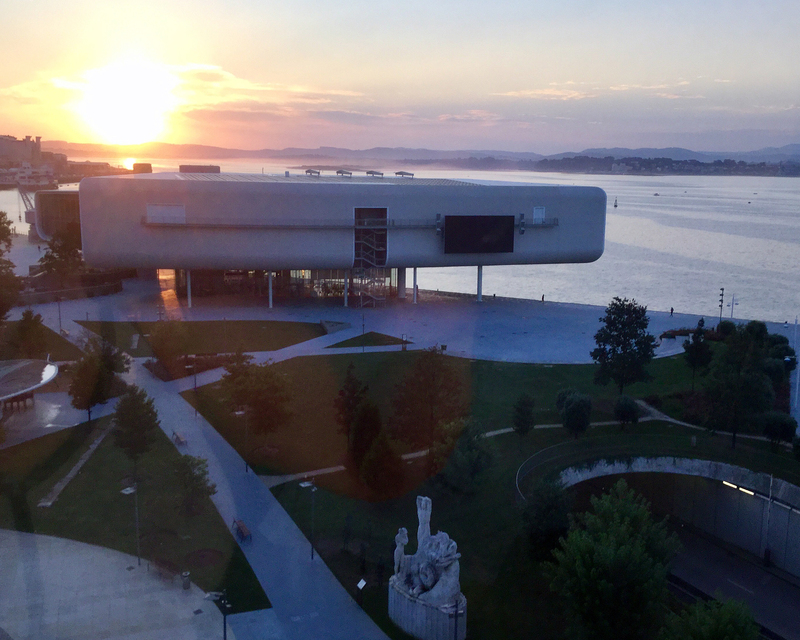 For me as an interdisciplinary fine artist I found the conference and exhibition programme refreshing and ambitious. This was truly an international platform to debate and speak about print (in all its forms), craft, new technology and the hierarchies of arts practice - by the end I felt very much at home!" "Photomatter: The intersecton of Printmaking and Photography in Contemporary Art : Rebecca Beardmore chaired the session brilliantly and the flow of discussion around printmaking, materiality and photography was very thought-provoking and brought forward a commonality of shared philosophy between printmaking and photography. This was reflected through all the artists presenting. The work of Beardmore struck me as it displayed the ambition of printmaking through its ever expanding physical properties, creating a bridge for me as an artist between the work of Beardmore and my own approach to capture a sensation of landscape through the vitality of print media." Thanks everyone, it sounds like it was an exciting and incredibly interesting time - and there was definitely a lot of knowledge being shared! 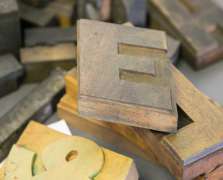 Our A-Z of Print Studio is way for us to share further insight into what happens in our Print Studio - there's always a range of exciting creative projects and courses taking place! If you want to find out more, join us for one of our Print Studio tours: you'll get an introduction to our state-of-the-art facilities and inspiration of what can be achieved in the studio. These take place on Thursdays at 18:30 and Saturdays at 12:00 and are free, but please book.